You likely associate cantaloupes most strongly with the orange-fleshed market melon with a netted rind, widely available at high summer. Purportedly named after the Italian papal residence of Cantalupo, where this cousin of the cucumber reputedly made its European debut after arriving from Persia, cantaloupes actually vary considerably in terms of flesh color and rind characteristics. They belong to the scientific family Cucumis melo, or muskmelons, with the familiar supermarket variety known as C. melo reticulatus. 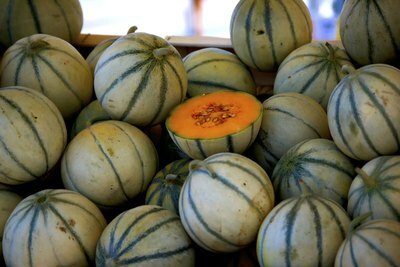 Market melons in the reticulatus group feature the familiar orange flesh, as well as green, golden and salmon shades. The rind gradually becomes covered in a raised, netting pattern as the melons ripen and the rind turns from green to tan. 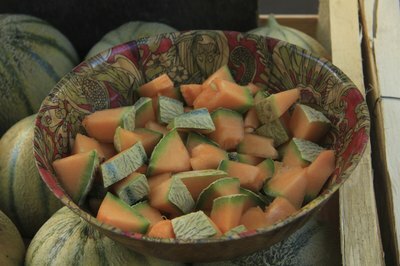 These cantaloupes may also be called muskmelons. The Ambrosia hybrid dominates home garden seed sales, typically producing a 5-pound melon with orange flesh and a thin rind. As for market types, consumers from Atlanta to Baltimore can enjoy the massive eastern-type cantaloupes, weighing 5 to 8 pounds and often grown in Georgia, with very deep grooves called sutures. 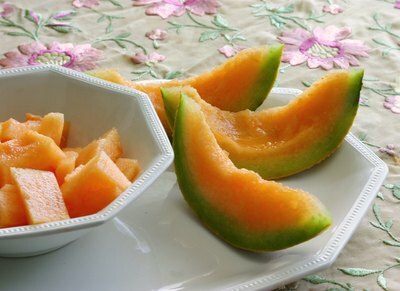 Athena is the most common eastern-type cantaloupe grown. Western-type cantaloupes, often grown in California, Arizona, Texas and New Mexico, have heavier netting and shallower sutures, and weigh from 2 to 4 pounds. But, technically, North American cantaloupes aren’t the real deal. The “true cantaloupe,” the European cantaloupe, C. melo cantalupensis, displays a sutured rind without netting. These varieties, including the best known, Charentais, a 2- to 3-pound French heirloom with a grey-green rind, and the Cavaillon variety, aren’t rugged enough for shipping, so you need to grow them at home. Or, you can try Savor, French Orange or Trocadero, all known for their high sugar content, perfumed flesh and gourmet taste. 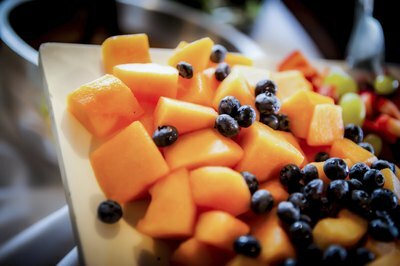 Look for the best North American cantaloupes, which are grown in the U.S. from June to September, with some market availability until December. Let your nose be your guide to the prime specimens, which should be aromatic and free of bruising. You can store them for several days at room temperature and refrigerate after cutting. 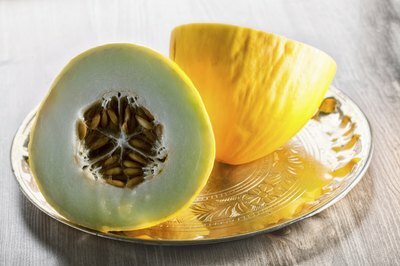 Crenshaws and honeydews, also called winter melons, appear later in the year and keep well. They have no aroma until you cut them open. How Does a Cantaloupe Plant Look?